Alolan forms of first-generation Pokemon creatures are the latest to land in Pokemon Go. Fans of developer Niantic's hit AR-based mobile title Pokemon Go will be excited to learn that a bunch of new pocket monsters are about to be added to the game. 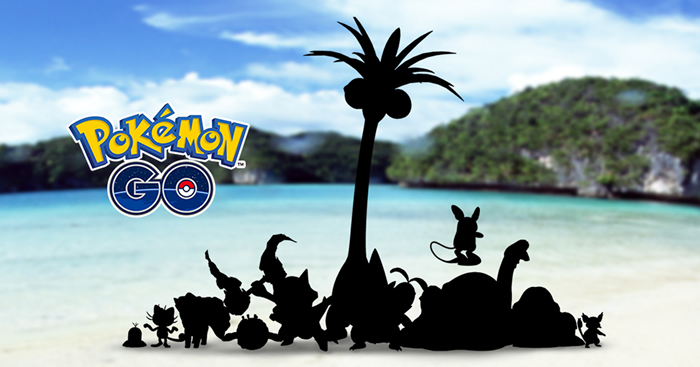 The studio has just announced that the Alolan forms of classic first generation series monsters are the next to arrive in-game, and they'll be here just in time for the summer hunting season. Niantic is keeping the details pretty light on this latest update, as might be obvious through the game's silhouetted teaser image featured below. However, we do know that the variants from both Pokemon Sun and Pokemon Moon should be arriving "in the coming weeks," according to a post made to the official Pokemon Go website. "Whether your forecast calls for rain or shine, we're celebrating all around the world by introducing some special Pokemon from the tropical Alola region to Pokemon Go," the post reads. "Get ready for some of the Pokemon originally discovered in the Kanto region to appear in their Alolan forms!" There were a total of 18 different Gen 1 Alola-region variants featured in Pokemon Sun and Moon. These included variants of Raichu, Vulpix, Dugtrio, Meowth, Rattata, Sandslash, Grimmer, Golem, Muk, and others. That said, it's not clear whether or not just some or all of these creatures will be arriving in Pokemon Go. Still, we know they're coming, and they should be arriving soon. Until they're released, players can expand their knowledge by checking out some of the latest details surrounding the upcoming Pokemon Go Fest 2018.